Peterborough Northern Star chase county club glory tonight (April 21) when they tackle Brackley in the final of the Northants FA Hillier Cup at Sixfields, the home of Northampton Town FC. Brackley are a Conference North side and will start as warm favourites against the team in seventh place in the United Counties Premier Division. Hayes said: “The management team and squad all believe we can win the game. “We finished our league season in a really good manner with three strong performances against quality sides and the lads cannot wait for tonight. “It will be a great experience to play a final at a professional ground and they are relishing the challenge. I’m confident they will have no problem handling the occasion. “There will be times in the game where we are under the cosh and that is when we have to defend properly as a team. Opponents Brackley are involved in a relegation battle ahead of their final league game of the season this weekend so could choose to rest influential players tonight. Former Chelsea and Leicester defender Frank Sinclair is the most famous man in the Brackley ranks. He still plays regularly at the age of 43. The county final is the first of two big cup clashes for Star this week. They host local rivals Yaxley on Saturday (April 25) in a Hinchingbrooke Cup semi-final at the Mick George Arena. Hayes added: “There are a hell of a lot of clubs who would absolutely love to be involved in a week like this at this stage of the season. Elsewhere there’s a nervous night ahead for AFC Stamford. The Daniels will be relegated from the Evo Stik Northern Premier Division tonight if rivals Frickley Athletic and Witton Albion win their matches at Ramsbottom United and Ashton United respectively. 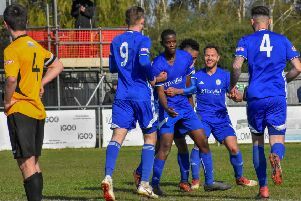 Witton is the key game as Stamford host them on the final day of the season on Saturday (April 25). If Witton don’t win tonight - and Ashton are fourth in the table - Stamford will just have to beat them at the Zeeco Stadium to survive. Spalding need to win their final two matches in Division One South to ensure their place in the play-offs. They have a tricky game at Tividale tonight. Deeping Rangers play their penultimate match in the ChromaSport & Trophies United Counties Premier Division at Harrowby this evening. A win would secure a top-half finish. March Town will clamber back into the top six of Division One of the Thurlow Nunn League with a point from their game at Dereham Town Reserves. There are three Peterborough Premier Division games tonight with the most significant taking place at Carter’s Park where relegation-threatened Holbeach United Reserves host Netherton United. It’s a big night for Premier Division side Moulton Harrox tomorrow (April 22) as they tackle Hykeham in the final of the Lincs FA Junior Cup at Lincoln City FC’s Sincil Bank ground. The PFA Minor Cup Final between Division Four Rivals ICA Sports B and Rutland DR is also scheduled for tomorrow at the Mick George Arena on Chestnut Avenue. Brackley v Peterborough Northern Star (Sixfields, 7.30pm). Harroby United v Deeping Rangers (7.45pm). Dereham Town Reserves v March Town United (7.45pm). Holbeach United Reserves v Netherton United (7.45pm). Peterborough Sports Reserves v ICA Sports (7.45pm). Stilton United v Sawtry (6.30pm). Moulton Harrox v Hykeham Town (Sincil Bank, 7.45pm).